CAF (Conductive Anodic Filament) describes a chemical effect where copper ions migrate within FR-4 base material. This happens only when you have high DC voltages between two conductors. 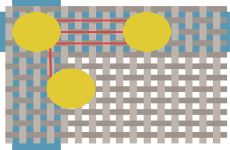 After a while the ions grow a path and shorten the connection. 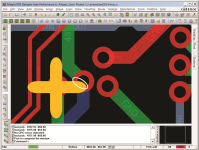 FloWare CAF DRC offers a special Design Rule Check in PCB Editor for OrCAD and Allegro. It verifies the spacing between DC nets from the drill border to the next conductor depending on the voltage class. If the spacing is too small a DRC will be flagged. The accepted spacing depends on the value of the DC voltage and on the glas structure within the FR-4. Fine glas structures are critical for CAF and require more spacing. Glas stuctures are categorized in three classes fine (106, 1080), medium (2116, 3133, 2157) and rough (7628). 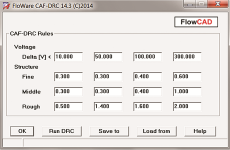 The check is performed with the matrix of spacing values for voltage class and glas category. Migration of electrons happens only following the glass structure, so the DRC will respect a orthogonal pathway within a FR-4 base material.